Put thinning hair in its place with this Age Defying Hair Spray. 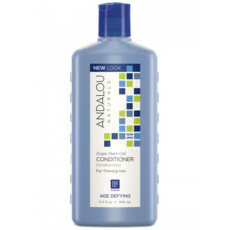 Style your hair as usual, but allow Andalou's Argan Stem Cell Technology to improve the longevity and vitality of the follicles. Hair will look healthy and glossy from root to tip. Natural ingredients help to reduce hair loss and create thicker, fuller strands without the use of sulphates or silicones. The medium-hold spray fortifies and conditions the hair for easy styling and protection against static, frizz, humidity and fly-aways, and is safe to use on coloured hair. Made in the USA, Vegan, Gluten Free, Certified GMO Free, Certified Cruelty Free. Aloe Vera, Argan oil, Vitamin B, White Tea, Ylang Ylang. Spray on roots for added volume, or spray over styled hair for the perfect finish. I was disappointed in this product. When you spray it, it comes out in one line of stream instead of a mist, so in other words it hits one spot on your hair instead of finely coating/misting it. It smells yucky- like some indistinguishable scent of toilet freshener. It has firm hold, but I fail to see how it’s age-defying ingredients can really take effect, as it’s not a product you’d want to douse your entire head in. I wanted just something pleasant and misting with medium hold to stop fly-aways when my hair is up- this is definitely not it. Will keep looking. I have been surprised by this hairspray. I wasn't sure how effective it would be but it has a very strong hold and I only need a small amount to get good coverage and hold. 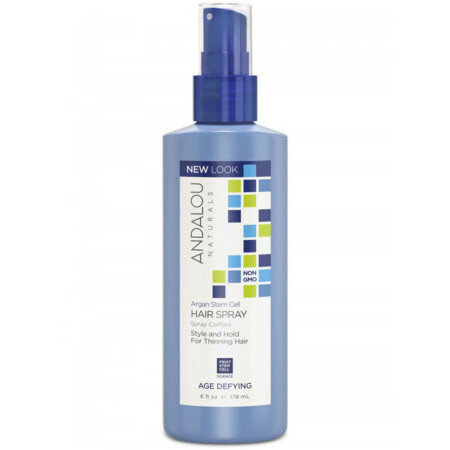 You need to hold it quite away from your hair when applying otherwise there is far too much product in one spray but overall it's a great swap from the chemical sprays. This hair spray was very sticky even if sprayed at a further distance. It made my hair greasy. I didn't like the smell either. Sorry.